Fully revised and updated for its second edition, The Power of Comics remains the most authoritative introduction to comic books and graphic novels – the history of the medium, its many forms and manifestations and their place in contemporary culture. 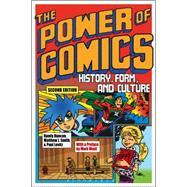 Illustrated throughout, with an extensive glossary of key terms, The Power of Comics also includes further updated resources available online at www.powerofcomics.com, including additional essays, weblinks and sample syllabi. Randy Duncan is a professor of Communication at Henderson State University and co-founder the Comic Arts Conference, the nation's first annual academic conference devoted solely to the study of comics. He is also the co-editor of Icons of the American Comic Book: From Captain America to Wonder Woman. Matthew J. Smith is professor of Communication at Wittenberg University where he regularly teaches comics arts courses. He is co-editor of the Eisner-nominated Critical Approaches to Comics: Theories and Methods. Paul Levitz is a former President and Publisher of DC Comics and has written for many of DC's major comic books series, including Superman and Batman. He is the only writer to have appeared on the New York Times Graphic Books Best Seller list for both his fiction and non-fiction work.